Hung Wu. Remaking Beijing: Tiananmen Square and the Creation of a Political Space. Chicago: University of Chicago Press, 2005. Copublished with Reaktion Books. 240pp. 133 halftones, 60 color plates. “Kublai Khan does not necessarily believe everything Marco Polo says when he describes the cities visited on his expeditions, but . . . only in Marco Polo’s accounts was Kublai Khan able to discern, through the walls and towers destined to crumble, the tracery of a pattern so subtle it could escape the termites’ gnawing.” Italo Calvino’s classic reflection on cities opens with the eloquent insight that urban essence lies in the intangible. The aptly titled Invisible Cities suggests that a city is not so much its physical structure as the movements of its inhabitants, the impressions it imparts to its visitors, the odors and hums oozing from its cracks, a timeless pattern so subtle it can transcend its ruins. These fictional metaphysical musings between the emperor and his envoy become weighty when considering the present fate of the ancient capital of Beijing, one of the Khan’s domains when it was named Dadu and proclaimed capital of the Yuan Dynasty in 1271. Whether innate characteristics of the city will survive radical alterations to its governing polity and urban fabric is an open question, inherent in the ambiguity of the opening sentence of Wu Hung’s book, Remaking Beijing: Tiananmen Square and the Creation of a Political Space: “As soon as Beijing was made the capital of the People’s Republic of China this ancient city reached a fatal moment in its survival.” Does “fatal” mean “lethal” or “crucial”? Was Beijing dealt its death blow or set upon the path of salvation? Wu Hung never clarifies his position, and urbanists are divided on the subject. 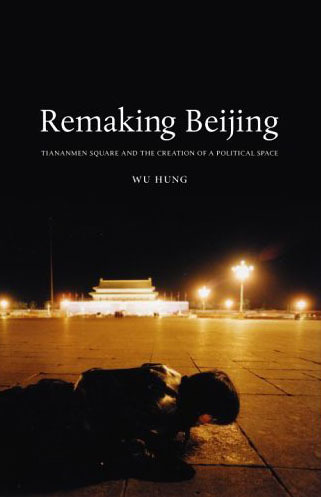 Wu Hung’s Remaking Beijing: Tiananmen Square and the Creation of a Political Space addresses Wu Huanjia’s concerns, detailing how the Communist Party sought to affirm its legitimacy by transforming Beijing into a beacon of socialism through symbolism associated with the sacred space of Tiananmen Square. The Coda briefly addresses the transforming fabric and infrastructure of Beijing, particularly its concentric outward expansion along its Ring Roads, but the study is primarily devoted to how the Party and the “People” (including artists) have symbolically altered its ideological center, the Square and its monuments. The book comprises five chapters on: the Square’s monuments, its portraits of Chairman Mao, its National Day Parades and Exhibition Architecture, its representation of time, and its art. Each progressively describes the Square’s symbolic transformations from a restricted imperial domain to a public arena for the political expression of a modern nation-state, from an epic symbol of socialism to a holy relic of Maoism, and from a stage for orchestrated political theatre to in situ avant-garde performances and spontaneous antigovernment demonstrations. Wu Hung leaves it to the reader to infer the implications of the Square’s altered symbolism for Beijing’s urban identity, and by extension, for Chinese political reality. In this book, as in many of his other studies, Wu interprets specific instances of visual culture without sustained historicizing or theorizing of the larger implications of such material, often creating more questions than he answers. His scholarship is valuable not so much for its rigorous theoretical insights as for its rich source materials, suggestive interpretations, and abundant, high-quality illustrations (in the present book, there are 193 in all). Wu’s recent books and catalogues, of which I am an avid reader, invariably provide rich food for thought. They include Body and Face in Chinese Visual Culture (Harvard UP, 2005), Between Past and Future: New Photography and Video from China (Chicago Smart Museum of Art, 2004), Reinterpretation: A Decade of Experimental Chinese Art: 1990-2000 (Guangdong Museum of Art, 2002), Exhibiting Experimental Art in China (Chicago Smart Museum of Art, 2000), and Transcience: Chinese Experimental Art at the End of the Twentieth Century (Chicago Smart Museum of Art, 1999). This book differs from his other books, however, in inserting highly intimate recollections of Wu’s personal relationship to the monuments under analysis. Evocative of Peter Rowe and Seng Kuan’s Architectural Encounters with Essence and Form in Modern China (Cambridge UP, 2002), where each chapter is preceded by informal dialogues between Chinese architecture students in an effort to personalize the objects under analysis, Wu Hung periodically inserts brief vignettes recalling his experience of the capital, its square and its symbols. Unlike Architectural Encounters, where the chatty diversions prove distracting, Wu Hung’s carefully wrought memoirs enhance the emotive power of his study. In Chapter One, “Tiananmen Square: A Political History of Monuments,” Wu Hung approaches the Square as an “enriched image,” “a vast open ground centered on and defined by a series of monuments constructed over a period of some five hundred years” (15). Wu traces the spatial evolution of the Square from its modest T-shaped structure, first constructed in the fifteenth century (commonly referred to as “historical Tiananmen Square,” although the term guangchang is a modern invention), to its modern incarnation as the largest square in the world. He then historicizes the “war of monuments” in the Square by framing debates over the design of the Monument to the People’s Heroes with a discussion of its symbolic replacement by the Goddess of Democracy, the sculpture representing the student movement, placed in the Square from May 30 to June 3, 1989. The Monument to the People’s Heroes gave visual form to the regime’s revised understanding of history under socialism. Proposed in 1949 prior to the founding of the PRC, the Monument was not completed until 1958, its final form and location deemed by Australian art historian Simon Leys to be “‘a good sneeze’ in ‘a concert hall at just the most exquisite and magical point of a musical phrase'” due to its assault on the sublime architectural harmony of old Beijing. This reaction was exactly the effect the Party was seeking, suggests Wu, quoting an official document that reads “someone thinks that the view along [Beijing’s] central axis . . . should not be blocked. But through study we have recognized that the axis of the present Square is no longer the past Imperial Path” (25). With its inscription written by Mao, its location chosen by Zhou Enlai, and its unconventional northern orientation chosen by Peng Zhen to face the portrait of Mao symbolically surveying the masses from the Tiananmen gate, “the new scheme signified an intention to group all architectural elements in the Square into a self-contained unit independent from the rest of Beijing . . . a new hierarchical structure of the city emerged: the Square became the meeting point of the four directions and thus the heart of the capital and the whole country” (27). The Monument is dedicated to deceased heroes, but its figures remain impersonal and conceptual, “its reliefs and inscriptions . . . not intended to be connected with any individual except Mao” (34). The Goddess of Democracy, Wu Hung argues, “abruptly changed the Square’s existing spatial structure and political significance” by creating a new center of gravity in raising to six (Mao’s portrait; Monument to the People’s Heroes; Great Hall of the People; Chinese Revolutionary History Museum; Mao Memorial Hall) the total number of monuments in the Square (16-7). The Goddess directly faced Mao’s portrait, identifying the students as living symbols of revolution by displacing the Monument to the People’s Heroes (or “Martyrs”) and the Chairman Mao Memorial Hall to their south. Wu applies Pierre Nora’s distinction between “dominant” lieux de mémoire imposed from above and “dominated” sites, “places of refuge, sanctuaries of spontaneous devotion and silent pilgrimage, where one finds the living heart of memory” to describe how the Monument became superfluous (replaced by the Mao Memorial Hall) to official symbolism after Mao’s death, but was indispensable for a growing dissident public. He enumerates a number of art works completed in the months prior to the student demonstrations that prefigured the fate of the Goddess of Democracy and many of those she represented. The Goddess was a monument that was intended to be destroyed, Wu says, because its monumentality would derive from such self-sacrifice, whereas the Square’s “permanent monuments are consequences of revolution . . . but not revolutions themselves” (49). In Chapter Two, “Face of Authority: Tiananmen and Mao’s Tiananmen Portrait,” Wu Hung suggests three implications of mian (“face”): portrait or mask, architectural façade, and signifier of spatial systems and relationships, as ways to understand the most illustrious “face” of all in the People’s Republic of China. Unlike emperors who concealed their presence behind gates and walls, the leaders of the modern nation displayed their visages. The portrait of Sun Yat-sen was the first to hang on Tiananmen, a frontal image flanked by written slogans, conventions inherited in Mao’s portrait. Mao’s first portrait appeared on February 12, 1949, replacing that of Chiang Kai-shek after the Communist army captured Beijing, his image (not his person) surveying a mass celebration of 200,000 residents in front of Tiananmen. Wu attributes the longevity of the Mao portraits (damage from the elements required they be repainted every year), which have remained for nearly sixty years despite Mao’s publicly acknowledged “mistakes,” to their role as primary symbol of the nation and the Party. He interprets each of five major versions of the portrait to demonstrate how its representation and meaning were subject to reinterpretation based on predominant political ideologies. He notes how, unlike the 1949 version, which reveals traces of informality and the artist’s distinctive style, subsequent versions are stylized and impersonal, with Mao depicted as staring directly into the onlooker’s eyes, his gaze dominating the Square. Chapter Three, “Displaying the People: National Day Parades and Exhibition Architecture,” starts with a rather disjointed description of National Day parades before discussing the vision for the Ten Great Buildings and other Beijing monuments to commemorate the Tenth Anniversary of the founding of the PRC. Although internal Party documents conceive them as a “mass movement” (qunzhong yundong) orchestrated by authorities, propaganda documents attribute their design and construction to the spontaneous revolutionary spirit of the Chinese people. The people themselves believed this because “in 1959 many Chinese, including a majority of the architects and designers of the Great Hall of the People, still held a romantic notion about the revolution, genuinely believing that they were creating a society of the people and for the people” (126). Indeed, Sidney Rittenberg (Li Dunbai), then a Chinese Communist Party member, attests to the enthusiasm with which he and fellow work unit members constructed the Great Hall in his memoir The Man Who Stayed Behind (Duke UP, 2001). The importance of the people in nation-building is also signified by the thirty-four Regional Halls, which are named after the country’s thirty-four provinces, autonomous regions, and municipalities. An official guide to the rooms reads “designed and decorated by artists and architects from different parts of the country, they collect in one place the local or regional cultures from across the country, concentrate and exhibit the natural scenery and cultural life of the local people, and symbolize the unity and unification of the Chinese nation” (122). This symbolism extends to the postsocialist period. For example, in 1994 my husband, Ren Qingguo, then an instructor at Guangxi Art College, was commissioned to update the interior design of the Guangxi Hall, which he decorated with Yao and Zhuang ethnic motifs. Wu finds, in these practices, vestiges of the ancient “tribute” system first recorded in the Book of Documents: “produced by artists and artisans past and present in different localities, these images and objects are gathered in the Great Hall to symbolize the allegiance of these regions to the central government” (122). In Chapter Four, “Monumentality of Time: From Drum Tower to ‘Hong Kong Clock,'” Wu Hung investigates the relationship between political time and political space in Beijing, focusing on various ways of public time-telling in the city’s history. The Qianlong emperor’s 1747 inscription on the Drum and Bell towers elucidates the imperial rationale for their function. Qianlong praises the wealth and population of his divine capital, “but when things multiply, opinions become diverse. Unless an instrument is created to unify people’s minds, synchronization of dawn and dusk cannot be achieved” (145). Located on the northern end of Beijing’s central axis, the Drum and Bell Tower were understood as a far-reaching projection of imperial power from the throne halls into the public domain: “The sound of the drums and bell dictated to Beijing’s residents when to work, rest, open the city gates or retreat to individual courtyard compounds: this was the schedule of a community in a tightly walled city” (150). These towers were silenced in 1900, their function replaced by European-style clock towers, signaling a crucial shift in historical temporality from traditional empire to modern nation-state. Wu devotes much of the chapter to a discussion of the giant digital clock installed in 1994 on the façade of Museum of Chinese History to time Hong Kong’s return to China. He interprets its location, between the north wing devoted to modern history and the south wing dedicated to traditional history, as implying the year 1840, the humiliation of the Opium War chosen by Mao as the start of modern history: “That the Clock blocks the museum’s entrances symbolizes the incompleteness of this historical process [of the people’s struggle for independence]” (134). 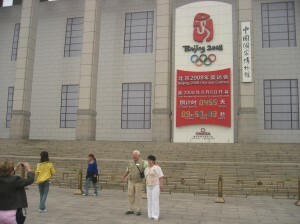 Figure 1: The Olympic countdown clock in front of the National Museum of China, formerly the Museum of Chinese History. “The Clock provided the days and seconds left before 1 July 1997; we wonder why hours and minutes were not given. The answer must be that the rapidly running number of seconds, although of little use for actual time-telling, most acutely (and dramatically) conveyed the impression of the fast disappearance of the present and hence the fast approach of an anticipated future” (135). Wu clarifies the significance of this temporary structure by reviewing the political contestation between Hong Kong and Beijing in 1993 and 1994. When seventeen rounds of negotiations between China and Britain ended in failure and the Legislative Council in Hong Kong voted the final package of the Patten Proposal into law, effective June 30, 1994, it was countered by the Part asserting that the Council would be dismantled after July 1, 1997 and replaced by a “legal representative institution,” events marking the time span of the Clock. Interestingly, a temporary clock counting down to the Opening Ceremony of the 2008 Olympics is currently located on this same site (fig. 1). Perhaps confirming Wu Hung’s reading of the Hong Kong Clock, the Olympics Clock counts down to August 8, 2008 in readable days, hours, minutes, and seconds, the frantic rush to erase the imperialist past unnecessary a decade later when the nation stands secure in its international status as a nation on an equal footing with other superpowers. In Chapter Five, “Art of the Square: From Subject to Site,” Wu Hung concludes his study with a lengthy discussion of artistic representations of and interactions with the Square. Wu declares that contemporary art forms (performance, installation, and multimedia art) provided possibilities for unofficial artists to engage with, rather than merely depict, the Square, repeating a theme, if not a thesis, that runs through his study. He makes a case for the influence of the Chinese avant-garde on popular oppositional politics, suggesting that works and concepts developed by underground poets and artists led directly to contestations of hegemonic state power. Wu explicitly connects artists to the 1989 student movement, and argues that even if today’s artists no longer directly instigate opposition, their work reveals the impotency of the Square’s State symbolism.Wu begins his survey of the art of the Square by contrasting imperial court paintings of Tiananmen and the Forbidden City with those from the twentieth century. The former represent political authority through framing an empty center, rendering the emperor’s power through his invisibility (171). 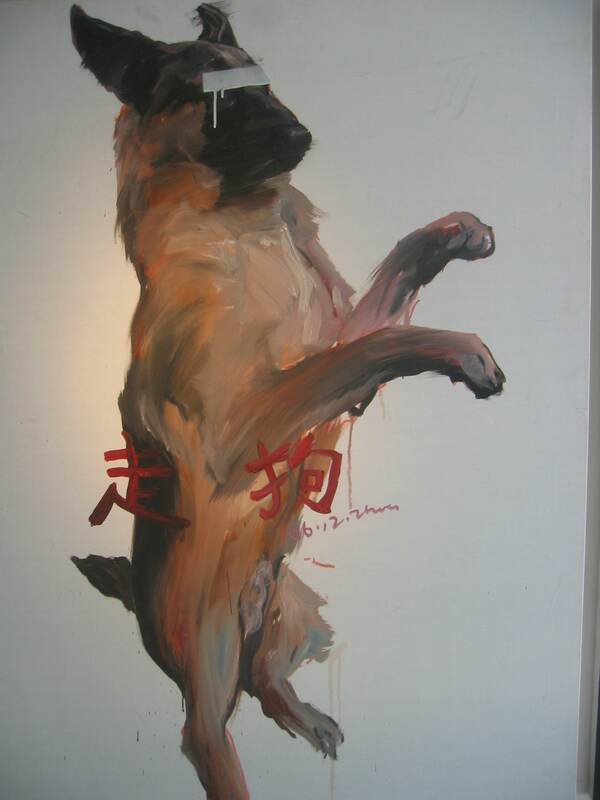 In contrast, modern leaders commissioned historical paintings to immortalize their larger-than-life roles at crucial moments in modern Chinese history. The most famous example is Dong Xiwen’s The Founding of the Nation (1952-53), which depicts Mao on the Tiananmen balcony proclaiming the establishment of the PRC, with other leaders depicted a head shorter and at a respectful distance behind him (172). Mao’s authority, says Wu, is achieved by his central position, extraordinary physique, and the artist’s creative use of perspective: “The leaders are portrayed as convincing individuals; the parading masses in the Square derive strength from collective anonymity; combination of two – above and below, leaders and people, constitutes a comprehensive representation of New China,” leading Mao to exclaim, “what a great nation!” (173). The current version of Dong’s painting (the painting changed over time when discredited leaders were expunged) is part of the Museum of Chinese Revolutionary History collection, signifying the persistence of the Party’s fundamental ideology. The remainder of Chapter Five addresses counter images of this and other iconic Party symbols to demonstrate the ongoing contestation over the Square’s symbolism. Wu Hung isolates three works created in the 1980s, 1990s, and 2000s to represent ways in which experimental Chinese artists have appropriated official representations of two of the most important visual symbols of Communist China: Mao and Tiananmen. Wang Guangyi’s Mao Zedong—Black Grid and Mao Zedong–Red Grid (1988) overlay Mao’s portrait with a grid structure similar to those used during the Cultural Revolution, when painters drew grids on the canvas to copy the portrait to scale. In bringing this hidden grid underneath every Mao portrait to the surface, says Wu, Wang restores the portrait’s historicity and artificiality, liberating the viewer from emotional engagement with the image. 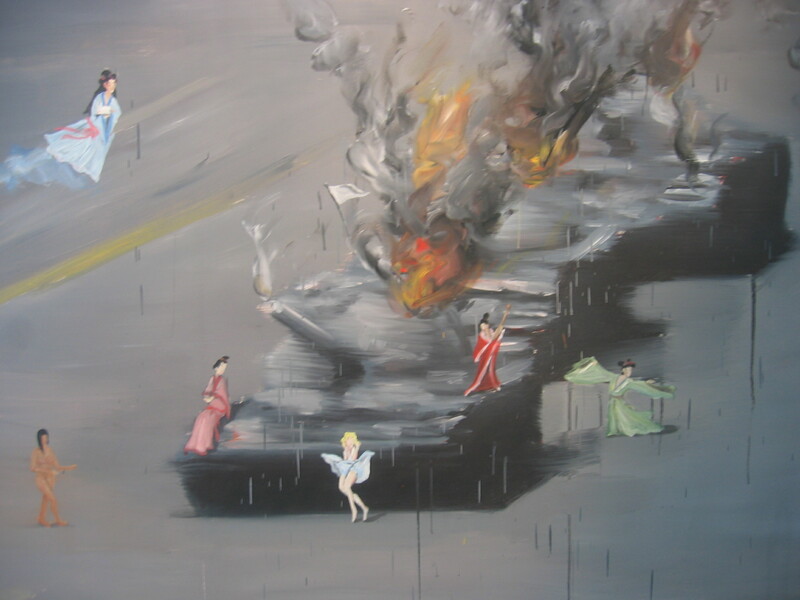 Wu argues that Wang adopts a prevalent 1980s strategy of objectifying Mao and Tiananmen, Wang Jinsong’s In Front of Tiananmen (1991) represents 1990s art that reframes Mao and Tiananmen within the artist’s personal experiences, and Shao Yinong and Mu Chen’s New China (2003) comprises twenty-first century digital photographs that “empty” Mao and Tiananmen. Because these latter works appropriate iconic paintings such as Dong Xiwen’s, Wu reads them as demonstrating a sense of ease in manipulating official models, evidence that once powerful images are echoes of the past. Wu concludes this chapter by discussing 1990s performances by artists in the Square, including works by the Gao Brothers (Gao Zhen and Gao Qiang) and Song Dong. Here, as in the study as a whole, one finds the occasional interpretive gem to guide one’s reading, but more often than not one becomes drawn into the minutiae of evaluating Wu’s interpretations of specific works, some open to contestation, only to emerge frustrated at the lack of a larger roadmap. In the Coda to Remaking Beijing, Wu Hung draws, almost in passing, one of the most interesting conclusions of his study. After detailing changes to transportation infrastructure as Beijing expands concentrically from its former city boundaries, Wu remarks that while Tiananmen Square “maintains its physical integrity and ideological coherence” despite the tremendous changes around it, “it has become merely a ‘conceptual center’ of the city and country, a place insulated from the outside world where real events take place” (242). This, he says, is best illustrated by the temporary installations (often made of flowers) now routinely constructed in the Square to celebrate the founding of the country and other important occasions. Wu Hung calls these installations of impermanent form and fluid content “soft monuments,” explaining that “unlike a ‘hard monument’ from the previous era that commemorated history and demanded faith, a ‘soft monument’ of the 1990s and 2000s is deliberately short-lived and goal specific” (242). The increased presence of “soft monuments” in Tiananmen Square discloses a government agenda to ostensibly depoliticize the Square, and by extension, all of society. “Instead of empowering the Chinese people to carry out political or military campaigns against domestic and foreign enemies, images in the Square now express citizens’ happiness and unification” (243). To my mind, the significance of Wu Hung’s study lies in tracing of the transformation of Tiananmen Square’s political symbols from “hard” to “soft” monuments, replicating a global shift initiated with the advent of technologies of modernity and accelerated by neoliberal market mechanisms. Leftist Chinese intellectuals have denounced the easy acquiescence of the populace to orchestrated forms of historical erasure in the name of modernization. Because the prevailing ideology seeks to erase concrete memories of political history, Beijing artists have, for over a decade, conducted a number of in situ performances around the Square to reclaim this history. 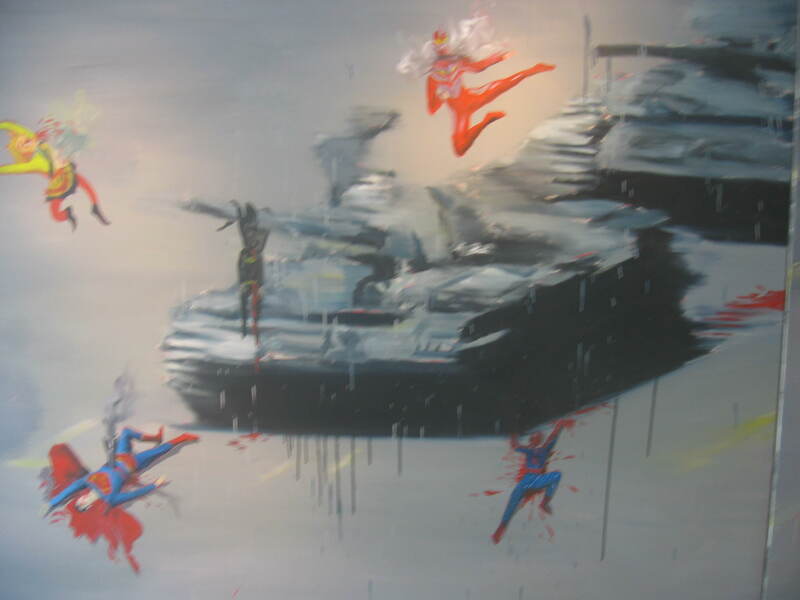 At the Dashanzi International Art Exhibition in May of 2007, many artists display recent historical events and current social problems in uncompromising terms. One small exhibit of oil paintings by an artist surnamed Zhou (fig. 2) depicts tanks surrounded by miniature action figures or Peking Opera figurines, powerless to halt their assault; a blindfolded dog on his hind legs labeled “running dog” (zou gou); a blindfolded, eviscerated, bloodied hog, its innards protruding, held up by its hind legs by two white-gloved, black sleeved arms, labeled “slaughtered pig” (sha zhu). As I observed the exhibition two stylish Chinese professionals in their early twenties walked into the tiny space, and looked carefully at the paintings before one commented “I just don’t understand what these artists are trying to convey,” a sentiment shared by her partner. Astonished, I ventured hesitantly, “Is it true? You don’t understand these paintings”? “Not at all,” they answered. I mentioned the year 1989, pointed out that the miniature figures appeared powerless to stop the tanks, before gesturing toward the disparaging slogans. “Oh,” one said, nodding thoughtfully. “Oh, I’m beginning to understand.” Wu Hung, like these artists, frames Remaking Beijing within the government crackdown on demonstrators in and around Tiananmen Square on June 4, 1989 to retrieve its traumatic historical memory. Italo Calvino, Invisible Cities (Le città invisibili), Tr. William Weaver (New York: Harcourt, 1974), p. 5. Wang Jun, Chengji (City records), Beijing: Xinhua shudian, 2003. Victor Sit, Beijing: The Nature and Planning of a Chinese Capital City, World City Series (New York: John Wiley and Sons, 1995), p. 215. Wu Huanjia.”Lun Zhongguo chengshi huanjing de xin yu jiu: yi Beijing wei li” (On the old and the new in Chinese urban environments: the case of Beijing). Jianzhu xuebao 6 (1988): pp. 33-37.